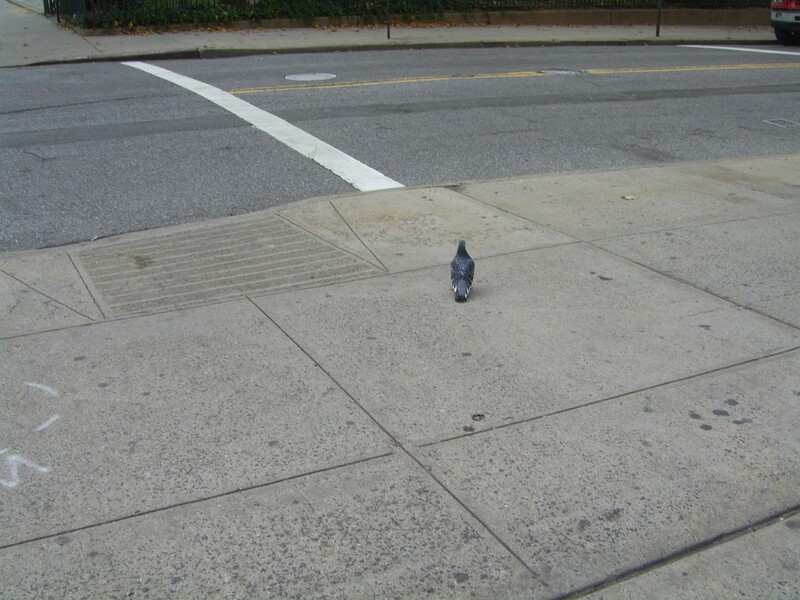 One of New York’s law-abiding citizens – a pigeon awaits the walk across signal at the intersection. Ms. K’s favorite picture. 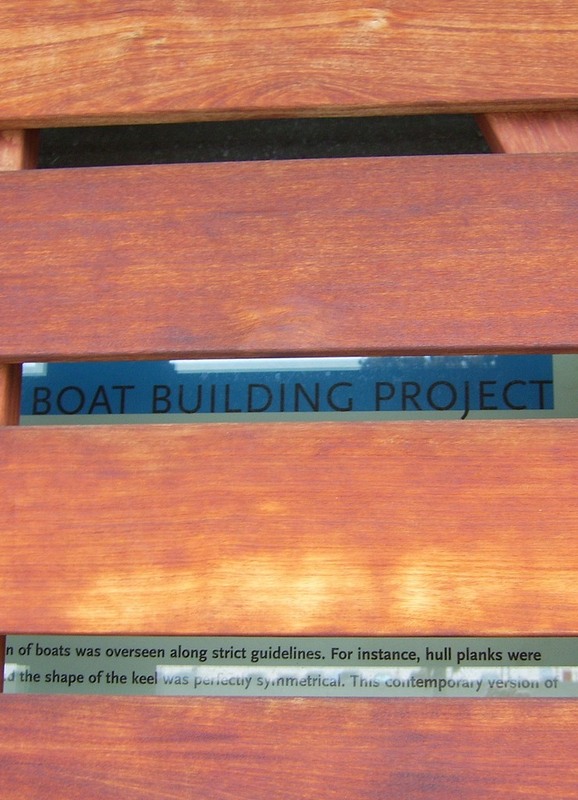 Not a winter thing, but this notice that I found taped to a building at Pier 84 describes three wonderful opportunities for residents and tourists alike including build a boat workshops, rowing the rivers around New York City and learning to row. Very nifty. That is very, very nifty also – this is one of the Apollo or Gemini capsules which went with the rockets that took our astronauts to orbit the earth and then, the moon. 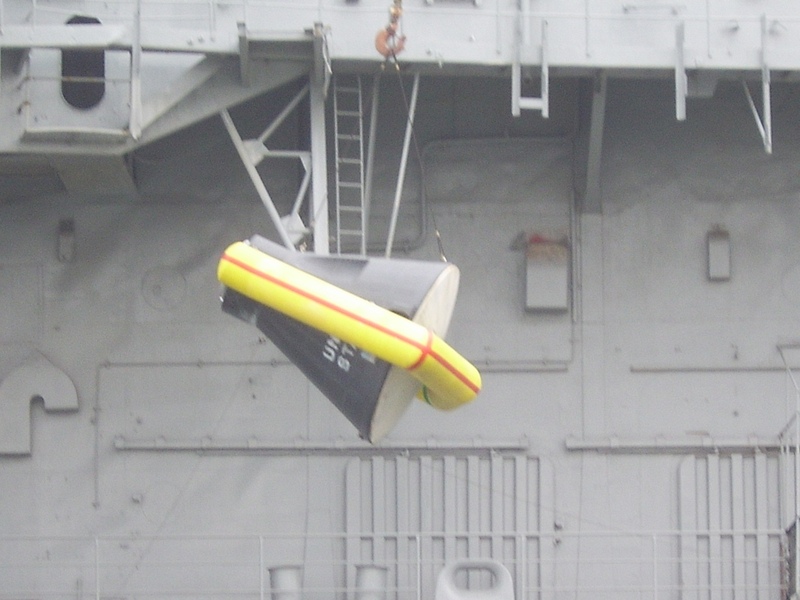 It is hanging on the side of the Intrepid and can be seen from the pier park on the left hand side of the ship from the Museum entrance. The same area is where the little boathouse can be found where there are rowing opportunities in the Spring, Summer and maybe also in the Fall for residents and visitors to New York. The sign on the window says there is no cost for participating in the rowing groups. They also have a boat building thing going on in the building which sounds just too nifty to pass up. When would any of us get to help build a boat or have that experience in this day and age? It says that February 19 – 17 is Kids’ Week – I think they include big kids in that too – like me . . .
Countdown to Intrepid Kids Week 2011! Did you know that you can volunteer at the Intrepid Museum – hmmmm…… wouldn’t that be the most fun! The Intrepid Sea, Air & Space Museum is one of America’s leading historic, cultural and educational institutions. Our mission is to Honor Our Heroes, Educate the Public and Inspire Our Youth. As an educational and cultural not-for-profit, the Museum is dedicated to promoting the awareness and understanding of history, science and services through its collection, exhibitions and programming. Volunteers are integral part of the Museum. Our volunteer staff works either with the public or behind the scenes. Volunteering is a labor of love: time is most valuable. The volunteer program offers many educational opportunities such as museum services training, docent training, a monthly educated volunteer lecture series, and customer service training. As a volunteer with Intrepid you will receive discounts/reciprocity at other museums, uniform, and unending free admission to the museum for you and a guest. Free to the Public, Floating the Apple offers traditional, wooden boat building year round and maintains a small fleet for 5 crew, sweep rowing for all ages, seasonally. Boats are launched from its boathouse dock into the cove flanked by the awesome Intrepid Sea, Air and Space Museum. To restore universal access onto the public waterways and to introducing the public, especially young people, to the joys of rowing and sailing on the urban waters. To bring people back onto the rivers and bays of NYC and to putting them in daily touch with the wonder, commerce and heritage of the city’s natural harbor, its greatest outdoor space. 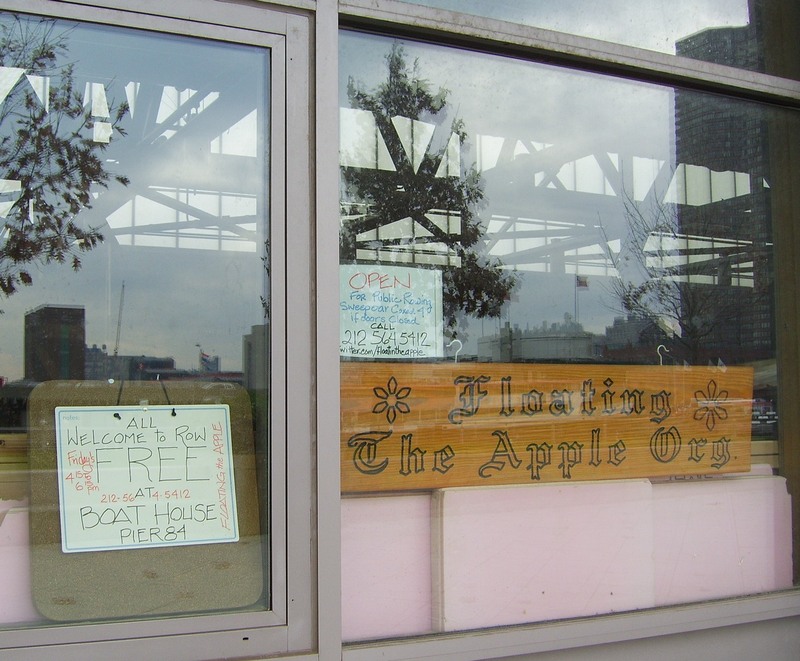 Since it’s founding in 1992, Floating the Apple has built rowing gigs to be distributed to boat houses throughout the metropolitan area. We have collaborated and held events with boat rowing facilities on piers along the Hudson River, the Bronx and Connecticut. Rowing our 26’ Whitehall Rowing Gigs at Pier 84 Community Boathouse is open to all and always free of charge. We schedule rows up the river routinely, by appointment. Visit us during rowing hours or contact us below. Sounds wonderful and so much fun. I think I would enjoy that a lot . . . not sure about rowing around on rivers, though. That is not like a video game where the action can be put on pause . . .
SUNY Maritime College is a maritime college located in the Bronx, New York City in historic Fort Schuyler on the Throggs Neck peninsula where the East River meets Long Island Sound. Founded in 1874, the SUNY Maritime College was the first college of its kind (federally approved, offering commercial nautical instruction) to be founded in the United States. The school offers Bachelor of Engineering degrees in electrical, facilities, marine, and mechanical engineering; marine electrical and electronic systems; and naval architecture. It offers the Bachelor of Science degree in business administration/marine transportation, general business and commerce (with a humanities concentration), general engineering, international transportation and trade, marine environmental science (with a meteorology or oceanography concentration), and marine operations. All bachelor’s degree programs may be combined with preparation for the professional license as a United States Merchant Marine Officer. The College also offers a master’s degree in International Transportation Management, as well as several graduate certificate programs. The electrical engineering and naval architecture degrees are accredited by the Accreditation Board for Engineering and Technology (ABET). The State University of New York is the oldest institution of its kind in the United States. After the Civil War there was a decline in the American maritime industry and there was a growing concern in the professionalism of its officers. In addition, there was concern over the dangers of accidents on ships, in particular aboard steam vessels. Closely tied into this was the push for a modernized navy as advocated by Stephen B. Luce and Alfred Mahon, with Luce in particular leading the charge for merchant marine professional schools. Through his efforts, an act was passed by Congress in 1873 that enabled individual states to request from the Navy retired or obsolete vessels to train seamen. The state of New York then appealed to the Navy for a training vessel. On December 14, 1874, the USS St. Mary’s arrived in New York harbor and became the home of the longest running nautical school in the United States. Originally run by the Board of Education of the City of New York, it was conducted as a grammar school that taught common school subjects (along with nautical classes) during the winter term, and then held practical cruises during the summer term. As time advanced, the school began to teach more advanced subjects such as navigation and the classification of grammar school became obsolete. 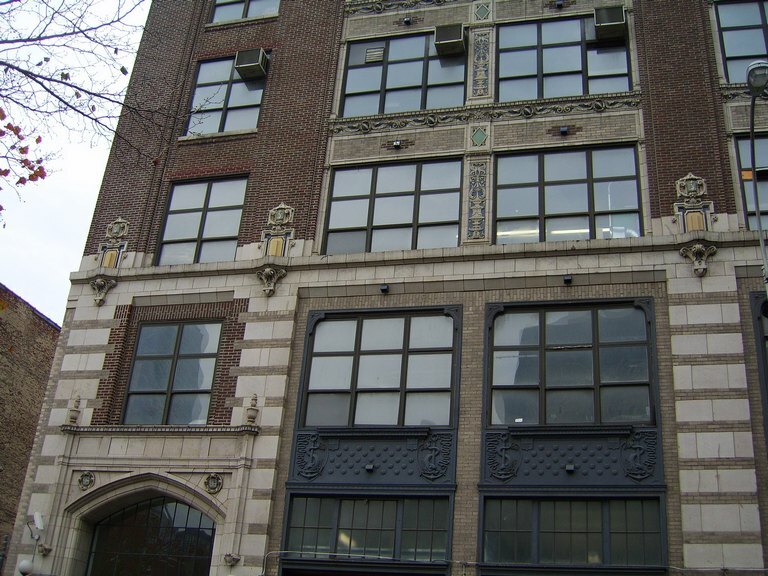 During this early period, the school was typically run on an annual appropriation of $20,000 to $30,000 with the school often facing closure because its cost per pupil was much higher than in a regular public school mostly due to the overhead of maintaining a ship where students lived. In 1907, steam vessels were clearly dominant and the St. Mary’s was obsolete. The school, therefore, acquired he gunboat Newport, a sail-steam hybrid. With New York City refusing to pay for the school, in 1913, the state of New York took over its management and renamed it the New York State Nautical School, opening enrollment to students state-wide. Despite being under state guidance, the school was close to being closed in 1916, again for budgetary reasons, but efforts from the maritime industry and the school’s alumni kept it alive. After this time, the American merchant marine grew and subsequently a greater demand for trained American merchant marine brought growth to the school. During this period, the school was administered by a Board of Governors in addition to the Superintendent. In 1921, the school, which had for long moved from berth to berth, found itself at Bedloe’s Island in New York Harbor. There, they were allowed to use the army facilities. Over time, conditions on the island were deemed inadequate to teach modern merchant mariners. With the growing demand, a push was made by then superintendent James Harvey Tomb beginning in 1927 to acquire a larger ship and a land-based institution. The ship came in the form of the Procyon which was renamed the Empire State. This ship effectively doubled the size of the school. Finally, the school, now called the New York Merchant Marine Academy, became land-based in 1934 at the Maritime College’s present Throggs Neck campus in Fort Schuyler. One of Franklin D. Roosevelt‘s last acts as governor of New York State was to sign the act turning Fort Schuyler and the Throggs Neck peninsula over to the school for use as a shore-based facility of higher education. Work restoring Fort Schuyler for the academy’s use was done at first by the Temporary Emergency Relief Administration (TERA) in 1934. In 1935, the Academy received a grant from the Works Progress Administration, who restored the fort and allowed the academy to operate there by 1938. In 1946, degree conferring status was granted and the academy became a college. The college is one of the original institutions incorporated into the State University of New York system in 1948 and was the first of its kind to enroll women, in 1974. The College’s primary ship, Empire State VI, is a 565 foot (172.2 m) vessel driven by a 17,160 horsepower (13 MW) steam turbine engine. Originally built as the SS Oregon, a break bulk cargo freighter for States Lines, it was converted by the Maritime Administration and delivered to the College for use as a training ship in 1990. The Empire State IV is host to cadet watches, classes and work parties during the “Summer Sea Term”, and departs each May with the college’s cadets on board for “Summer Sea Term,” a two-month training voyage. Athens, Dublin, Barbados, Antwerp, Naples, Barcelona, Genoa, London, Tallinn, Istanbul, Dubrovnik, Split, Kiel, and Copenhagen are some of the recent ports of call for the Empire State VI. Fleet Week is a United States Navy, United States Marine Corps and United States Coast Guard tradition in which active military ships recently deployed in overseas operations dock in a variety of major cities for one week. Once the ships dock, the crews can enter the city and visit its tourist attractions. At certain hours, the public can take a guided tour of the ships. Often, Fleet Week is accompanied by military demonstrations and airshows such as provided by the Blue Angels. That sounds fun – and get to see inside the boats and watch the Blue Angels too. Yeah, now that would be fun . . . I wonder when it is being held this year. Let’s see if I can find it and what the schedule looks like – there could be some really good stuff there. Describes the air show for 2010 with the Blue Angels and Canadian Forces CF-18 Demonstration Team on Memorial Day weekend. The Jones Beach Chalet is an exciting way for you and your family to enjoy the Bethpage Federal Credit Union New York Air Show at Jones Beach. Tickets include a VIP viewing location with outstanding food service, private beachfront area at flight line center offering unrestricted views, a shaded tent and reserved parking. Marine Corps Public Affairs New York City The Camp Lejeune based 24th MEU will be heading to NYC for Fleet Week New York . New York, New York say hello to your Marines . In recent years the 24th Marine Expeditionary Unit fought in Helmand Province, Afghanistan and provided assistance to Haiti . Fleet Week New York Although the ships have not been confirmed for this year’s Fleet Week, once they are our office will release the locations of where each ship will be docked. This annoucement is generally made in mid-April. For your general planning purposes in previous years, U.S. Navy ships have been located at Pier 88 (49th St. & 12th Ave.) in Manhattan and at the Stapleton Pier in Staten Island. If you have further questions, please feel free to contact our office at 757.322.2853. Another little bit on down the page describes the events from last year, some of which took place at different locations throughout New York City with demonstrations of military / naval informational and educational programs, things of interest, etc. Randall Clinton ‎@April, last year the Marine Corps had demonstrations in Times Square and Battery Park in Manhattan along with helicopter raid demonstrations in Coney Island (Brooklyn), Eisenhower Park (Long Island), Orchard Beach (Bronx), Corona Park (Queens) and Clove Lakes Park (Staten Island). You can visit us on the ship or join us at these off-ship events to see Marines simulate real-world helicopter-based attacks. Head over to www.facebook.com/NYCMarines and we’ll have the details as we get closer to May. The Marine Corps League perpetuates the traditions and spirit of ALL Marines and Navy FMF Corpsmen, who proudly wear or who have worn the eagle, globe and anchor of the Corps. It takes great pride in crediting its founding in 1923 to World War I hero, then Major General Commandant John A. Lejeune. It takes equal pride in its Federal Charter, approved by An Act of the Seventy-Fifth Congress of the United States of America and signed and approved by President Franklin D. Roosevelt on August 4, 1937. The Marines’ Hymn has been sung and played in all four corners of the earth and today is recognized as one of the foremost service songs. It has a list of the piers, along with photos from different time periods. Lots of interesting information. 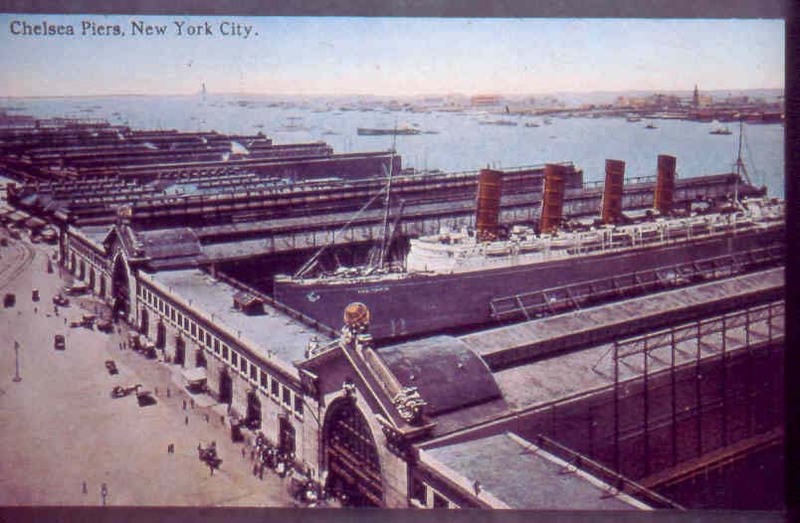 The Chelsea Piers, 900-foot long and built 1902-1910 with head houses designed by Warren & Wetmore (architects for Grand Central), handled longest liners of Cunard & White Star such as Mauretania, Lusitania, Aquitania, Olympic & Titanic. The Titanic should have docked at Pier 60. The piers became obsolete by 1960s with containerization. There is a really big boat in between those buildings. Oh wow. Not too long ago, another behemoth contended with the skyscraper for space in Lower Manhattan. On any given day, hundreds of ships manned by hundreds seafarers carried cargo from around the world to the one-time busiest port in the world. The Seamen’s Church Institute (SCI), a 177-year-old maritime service organization affiliated with the Episcopal Church, greeted seafarers over decades of change to provide for their needs while in port and at sea. Today, SCI opens the vault of over 170 years of history. [ . . . ] As maritime commerce’s influence on history emerges from this collection, some famous names appear in SCI’s storied past. Former president Franklin D. Roosevelt joined SCI’s Board in 1908 and served in different capacities until his death in April of 1945. Names like Astor, Vanderbilt, and Morgan swayed the direction of the Institute and solidified its presence on the New York City landscape. Explore the Institute’s Digital Archive Collection here. Wait, that was from only two days ago – hmmm…..
“Cuddle up and stay warm on our climate controlled yacht. View the city lights, explore the decks and dance to romantic dance hits with your loved one,” it says. Well, actually I couldn’t find anything about whether it is dinner and dancing or not – maybe people don’t dance on boats anymore. It could just be an eating and snuggly look at the city lights thing . . . Here is where I found out about it originally and it tells a lot about it before the hotel that it is now. However, now people can go there and stay and experience it – would be very interesting. 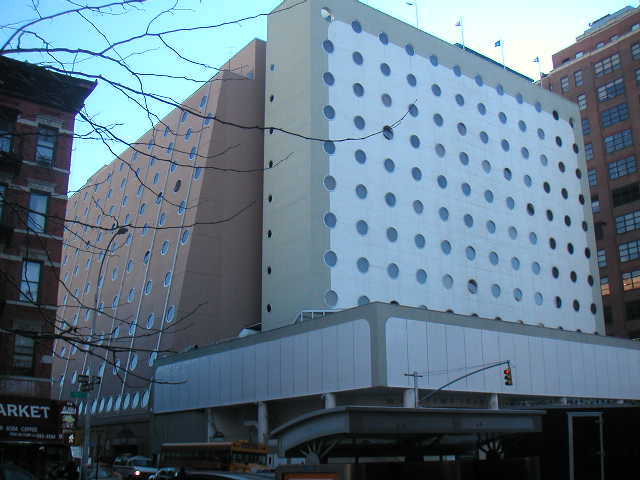 Guest rooms built for members of a sailors’ union – each with windows shaped like portholes – and later used by runaway teenagers and then by visitors from China are now occupied by hip visitors to New York in what is now the Maritime Hotel. The hotel is the latest incarnation of the white-tile 12-story structure that occupies the blockfront on the east side of Ninth Avenue between 16th and 17th Streets. The existing walls of the 120 guest rooms and 4 suites, each facing west and with a circular window five feet in diameter, are staying in place. The rooms, with new dark teak built-in furnishings and glossy white ceilings, are vaguely evocative of ship staterooms. Built in 1832, the Merchant’s House Museum is a unique survivor of old New York. 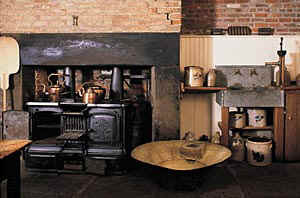 It is New York City’s only family home preserved intact – inside and out – from the 19th century. Home to a prosperous merchant family for almost 100 years, it is complete with its original furniture, decorative arts, clothing, and personal memorabilia. To visit the Merchant’s House is to experience what life was like for a wealthy New York City merchant family in the middle of the 19th century. When built in 1832, the house included all of the modern technological conveniences of the era, including piping for illuminating gas, a 4000-gallon cistern, and a bell system that summoned the four live-in servants. Three floors of the house are available for viewing, including the ground floor, with its original kitchen, and one bedroom floor. The museum is a member of the Historic House Trust of New York City, which works in partnership with the City of New York/Parks and Recreation to preserve, promote, and support the 19 historic houses located in parks in all five boroughs. The museum offers educational programs for adults and schoolchildren, walking tours, lectures, readings, concerts, and other events throughout the year. Today it survives as the only material link to that important era of New York City history when maritime commerce flourished, and New York became the preeminent port of the nation.The Museum is open Thursday through Monday noon to 5 p.m. Group tours are by appointment throughout the week.If you have any questions, please contact them at nyc1832@merchantshouse.com. Merchant’s House Museum, known formerly as Old Merchant’s House and as the Seabury Tredwell House, is a Federal-style red-brick row house built in 1832 by Joseph Brewster. 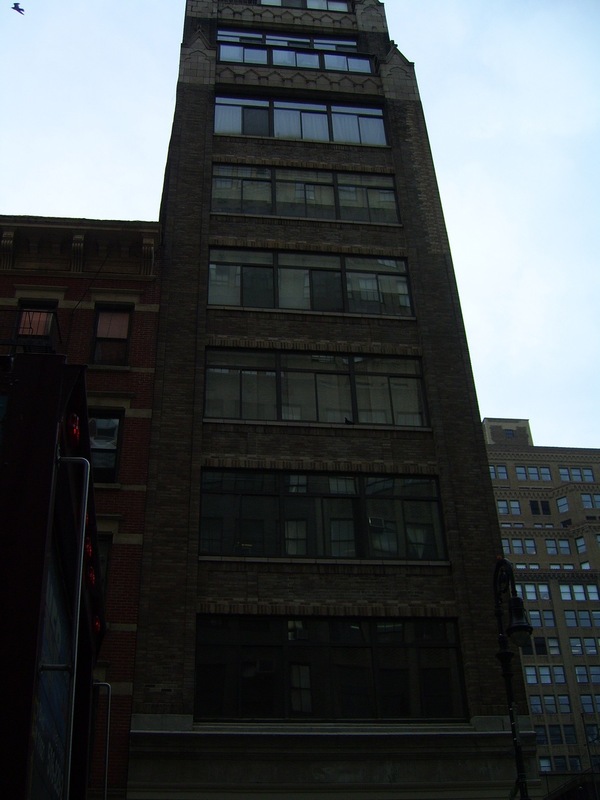 It is located at 29 East Fourth Street, between Lafayette Street and the Bowery, Manhattan, New York City. It was designed by Minard Lafever. It became a museum in 1936 and is the only nineteenth century family home in New York City preserved intact – both inside and outside. The building’s facade is reminiscent of earlier Federal-style homes, but the interior, especially the formal double parlors, represent New York’s finest example of Greek revival architecture. The interior also contains the Tredwell family’s original furnishings, including pieces from prominent New York cabinetmakers, like Duncan Phyfe and Joseph Meeks.. Considered one of the finest surviving Greek Revival rowhouses in America, the house is a miraculous survivor of old New York. The house is important for its outstanding collection of original furnishings, decorative objects, magnificently preserved 19th century clothing and other personal effects of the Tredwell family. Stepping through the front portal is stepping into a time when New York City was becoming the most important seaport in North America and the house reflects these fortunate circumstances. In addition to its magnificent period rooms, the Museum presents many performances, presentations, lectures, exhibits and special events throughout the year. Ongoing research and state-of-the-art documentation and conservation techniques assure that more is constantly being learned about the House, its furnishings and outstanding textile collections, and “what life was really like” for a 19th century New York family. Built in 1832 just steps from Washington Square, this elegant red-brick and white-marble row house on East Fourth Street was home to a prosperous merchant family for almost 100 years. Yes, a place from before cellphones . . .
During the searches online that I was making about New York City and New York architecture, I happened upon this story about the “Spite House” . . . Apparently at one time, when the streets were put in, the tiny bits of land left over made odd parcels in strange shapes and often small strips. So in this story, one neighbor with a strip of land only five feet wide by over a 100 feet long that sat next to Lexington Avenue in New York decided to spite his neighbor that wouldn’t pay him as much as he wanted for it. Instead of accepting the $1000 for it when he wanted $5,000 for it, the man fixed his neighbor by building a four story building on the strip of land – although it was only five feet wide and the full length of the property along the street. Undaunted, Mr. McQuade hired the prolific architect Alfred B. Ogden to design his apartment buildings, including windows on the lot line under the assumption that Mr. Richardson’s lot would forever remain vacant. Construction of the pair of buildings began on May 22, 1882, triggering Richardson’s spitefulness. Fresh from just having completed the construction of a marble-fronted row of three conventional one-family residences adjoining to the north, he returned to the drafting board and less than a month later, filed plans for a pair of buildings of his own, each 51 feet long, on the Lexington Avenue sliver lot. While each house was nominally only five feet wide, advantage was taken of a clause in the New York City building regulations that permitted corner houses to have bay window extensions. This enabled the main rooms on each floor to be a little more than seven feet wide. Since the Richardson buildings were much smaller than those of Mr. McQuade, they took less effort to construct, and were completed in November 1882, almost five months earlier than the side-street houses. Perhaps exhausted from the battle with Richardson, Mr. McQuade sold his two apartment houses on September 1, 1884, to Heyman Sarner, a local clothier. Richardson died in the house in 1897; during his lifetime the intersection of 82nd and Lexington was one of the most talked about in New York. In 1900, Richardson’s daughter from his first marriage, Dellarifa Richardson, tried to have his widow, Emma (her stepmother), evicted from the house. What happened is unclear, but by 1902 a new owner had converted the ground floor to stores. It also says that when Lexington Avenue was put in between Park and Third Avenue, it left those strange parcels of land as a result. Apparently that was in the 1860’s, and then the man who built the Spite House, Joseph Richardson, had purchased the odd-shaped lots including one in the middle of the block where he built three marble faced “brownstones” and the 5 foot wide by102 feet deep strip along Lexington where he built the four story apartments to spite his neighbor. He made the purchase through his niece and then applied for the building permits. It was torn down in 1915. Richardson and his wife lived in the ground floor apartment in the building which was so small that a stove and furniture had to be built specifically for it in order to fit. The halls and stairways in the house were too small for two people to pass at the same time and even the kitchen table had to be made for it which was listed in the article, as 18 inches wide. 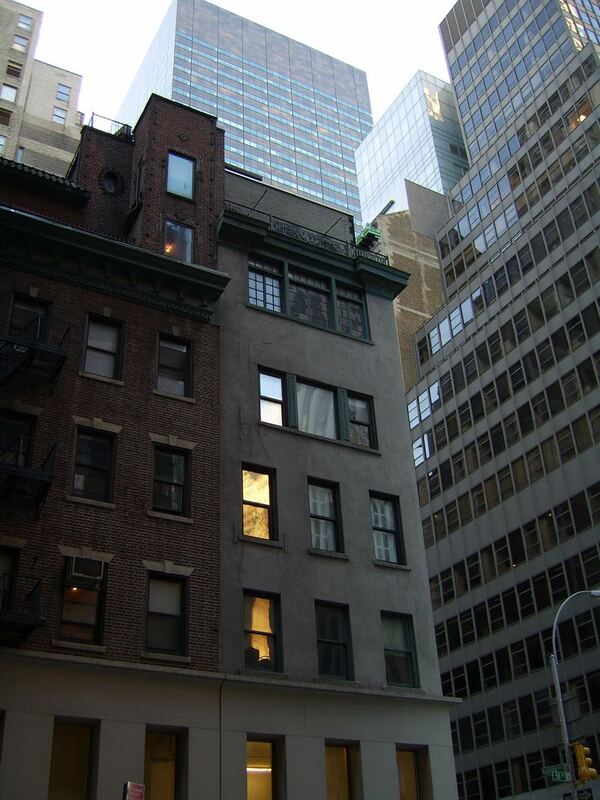 But, Mr. Richardson had managed to build the four story tall building and cover all the Lexington Ave side windows of his neighbor’s property . . . There is a photo of the building on the New York architecture page above, which is very hard to see where the building width of five feet ends and the next building begins. The three marble facade “brownstone” style row houses that Richardson built still exist according to the article. Both the “Spite House” and its neighboring building were torn down by Bing and Bing who put up another building in its place (around 1915). Very interesting to see the lengths that people have gone to “fix” their neighbor in America (and elsewhere) – maybe it is just as my daughter said, that we are all spiteful, mean-spirited and ugly to one another as human beings. Maybe it is as she said, the basic human-ness that we work with at our very nature and then we all try to do better, learn better, and act better despite that. Originally, knowing nothing about the streets being put into place which created odd shaped parcels of land – I was in New York taking pictures and noticed many small width, deep and tall buildings that were here and there stuck between other things that seemed totally out of place and out of scale with their surroundings. There are some buildings that are no more than two windows wide – now I know why that is . . . I should go back and take more pictures of them. That would make a great book. Also, although I had not known this before doing a bit of research at home, the terra cotta and stone on many buildings was intended partly for fire-proofing the living and working environments after a massive fire had been so costly early in the city’s history. I’m going to write some about that on future posts. It would be great to know where those terra cotta and stone elements were created, who created them, and who designed them. Many of these elements are so beautiful and elegantly done. And, they are everywhere in New York City. Welcome – this blog is one of four that I accidentally made trying to make one actually about touring New York’s nifty spots. So I’m going to use all of them to describe different parts about it. And, hopefully that will be a fun ride for those reading and easy for me to manage at the same time. My main blog is at cricketdiane.wordpress and it has a variety of information that is important or interesting to me. It started about my art and then ranged into financial and economic things when the economy tanked as I watched people on tv news claiming to be experts but either lying or getting it wrong. Now, it has a lot of things on it including some of the information about New York from my visit there. What it doesn’t really have room to do, I’m going to do here which is to put some of the photos, interesting information and tidbits about walking through New York City to see it firsthand without a budget of $10,000 to do it. And, this post will have a bit also about the things to do there which don’t cost a tremendous amount of money whether you are visiting or actually live there year round. On this and the other three blogs I’m creating about New York City, I hope to include some interesting stories I’ve found, classes that don’t cost a lot, interesting places to photograph and visit, ways to do things there which access vast arrays of valuable and handy resources, nifty businesses found there and things about the architecture or bits of history. It is the things like that which interest me and seem to interest others also. It is fun to talk about and fun to go see. I liked it when I as doing it and I really think others will enjoy it as well. There is always the possibility of taking on New York or anywhere else with a ton of money to use doing it. That is not the only way to do it however and even with a ton of money to spend, there are great things that could be included despite the fact they don’t cost a small fortune to do them. That would include ice skating which at times doesn’t cost anything at all or just costs the rental of skates. Personally, when I had gone to New York to visit, I was invited to sit in on the taping of a tv show, but didn’t do it because I really wasn’t dressed for it and needed a cup of coffee more. However, it would have been nice to know, before going there – that to get tickets to see nearly any of the tv filming requires some lead time to get tickets for it and those access points are online, many of which are at no cost to audience members. Things like that I will be posting here along with other tidbits that I discovered. Although I live in Atlanta and have only visited New York once, I really enjoyed it and found it very easy to navigate around using the subways, buses and wonderful wide sidewalks. I did have help though, because my daughter lives there and was amazed to find how many people helped me to find my way around and to understand the subway maps when I asked them. It never did become clear where I was in relationship to the google maps I had studied at home, but had I opened my laptop more often, it probably would’ve been fairly obvious how the real world of New York City fit together with the map worlds found online. This particular blog is going to be more of the inexpensive things that can be found and that can be accomplished visiting New York, hints about handy things like the show tickets being requested ahead of time – and like, don’t forget to eat the wonderful things that are there while there . . . Stuff like that. It is good to know that some people are not made for going up to the observation decks above the city, finding them to be a swaying nightmare of vertigo rather than enjoyable – and to know that many buildings allow visitors to photograph their beautiful murals and interiors created many years ago and still available to see. This blog is authored by me, cricketdiane – but while I’m going to do my very best to get things right (as in, accurate) – I am making no guarantees which means that it is worth checking to see that whatever said here is still the way it is – whether it is going about getting tickets to a tv show or anything else. It is going to be to the best of my ability and I welcome any comments that can help to make it better or contribute to the general knowledge offered here. Thanks for joining me on this great tour of New York City and welcome to what I hope will be an enjoyable and entertaining blog about it.